• Doesn't run on 10.6 Snow Leopard anymore. Voice chat is awesome, but sooner or later you'll send something you wish others hadn't heard. 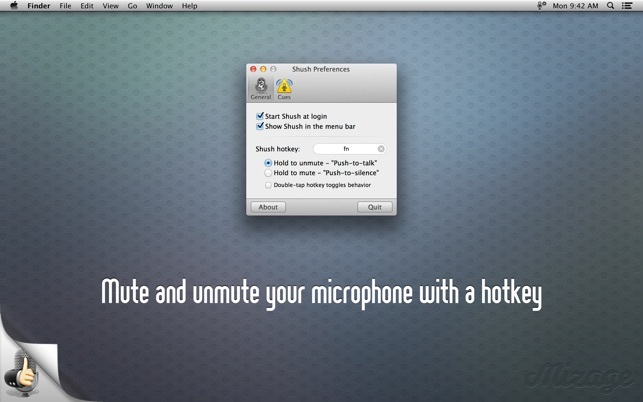 Shush solves this problem by providing simple hotkey microphone management. With Shush you’ll no longer have to feel awkward about the things going on around you. Whether it’s a plane flying overhead, your kids screaming, that sneeze (or something worse) you feel coming on, or just you talking to yourself, Shush makes accidental transmitting a thing of the past. In push-to-talk mode, your microphone will be muted until you press and hold a chosen hotkey, unmuting your microphone and allowing your voice to flow freely. Release the hotkey and Shush will mute your microphone again. 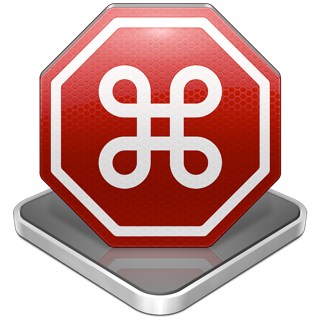 In push-to-silence mode (aka “cough button”), press and hold the hotkey to immediately mute your microphone so nobody hears anything you don’t want them to. Release the hotkey and Shush will unmute your microphone. Shush works with almost any* internal and external microphone or line-in, even USB and Bluetooth. 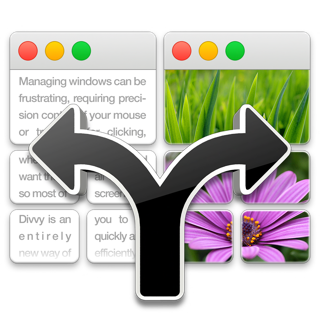 • Improved compatibility for OS X 10.10 Yosemite. • Improved ability to mute some devices that were previously unmutable. • Changed menu bar icon to be black and white. • Fix for output audio being muted if Boom is installed. This is a very simple app, and it works very well, but feels like it should be only $2 or $3. But that's sort of beside the point of whether it's good. It seems to have all the essential features, but needs some additions. For instance, it's easy to forget you're running the app, and wonder why no one can hear you in your WebEx/GoToMeeting/ScreenHero/Zoom/Hangout/whatever call. If the user could set a color for the muted icon, and a different color for the non-muted icon, it would be easier to avoid this situation. The ability to toggle with a double-tap of your chosen key is a nice idea, but I find that it's too easy to do that accidentally. It would be nice if I could make it a triple-tap, or otherwise have more flexibility in defining how to toggle between tap-to-talk and tap-to-mute. Or maybe define the maximum interval between the taps—that might reduce accidental toggling, which can cause lots of problems (if you say something to someone in the room or on the phone, that you don't want heard by people in the WebEx/whatever). This app does something I’ve wanted for years— mute by default, push to talk. After dozens of conf calls interrupted by people who failed to mute, this app is a godsend! 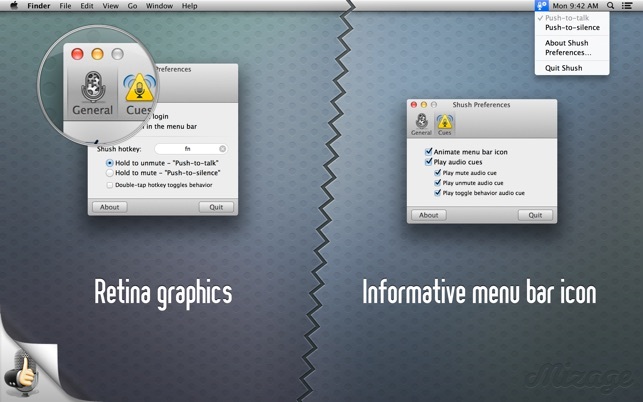 * more control over the audio cues. Being able to adjust their volume, or perhaps switch to some sort of onscreen indicator would be handy. As-is, the sound is a bit jarring. * The ability to differentiate between left and right side keys when specifying the mute/unmute key: I never use right-option, so I’d love to assign that (and not left-option). It does have one flaw in that when my mac comes out suspend mode the mic will be unmuted regardless of the mic state in the app. The causes me to toggle the mic state before going into a meeting just to make sure. Otherwise this app does exactly what I need.